Sometimes a wine is so good, so special, that it stays in your brain for days. Weeks, or even months. And sometimes it can force you to confront what you think you know about wine. That was the case after I was mesmerized by a bottle of 1994 Dunn Howell Mountain Cabernet. It wasn’t just that the wine was excellent—it was—but that the wine seemed to come from an entirely new place. 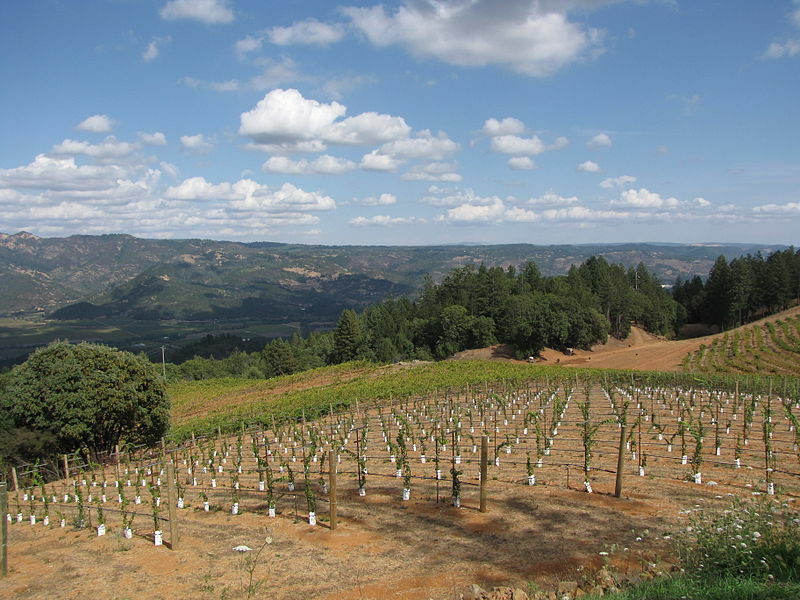 If I stretched my memory, perhaps it evoked older Mayacamas wines, but not much else. And it seemed built for only the most gradual, riveting evolution. Why, then, is the current edition of this wine only $75 a bottle? Why isn’t it a cult wine with a vertiginous price scale accessible only to those who know the secret handshake? It’s never quite that simple when it comes to wine, but I wondered if he were on to something. There is a large segment of the wine-buying population that wants high-end Napa Cabernet. And who better to ask about this, I thought, than Randy Dunn himself. Turns out that Dunn is not only convinced that mountain fruit is superior; he’s concerned that thousands of wine buyers are getting the kind of advice from major reviewers that will lead them to waste hundreds, if not thousands, of dollars. It’s wise not to over-generalize when talking about wine. But Randy Dunn doesn’t mind saying that mountain Cabernets age better than their counterparts from the valley floor. “That’s a fair generalization,” Dunn tells me during a short break on a harvest day. “The wines with the best track record tend to be mountain wines. I don’t necessarily agree with Dunn’s assessment; Araujo and Dominus, for example, are making long-lasting wines of distinction. But I agree that mountain wines are more likely to last a long time—and improve with that time in the bottle. There’s something else bothering Dunn. He says consumers are spending huge amounts of money on wines with gaudy point scores, but many of those wines will be dead by the time they’re uncorked. I went back and checked the label of that ’94 Dunn Howell Mountain: 13%. For some perspective I turned to a man with a great cellar, and a man who has done some of the finest writing about California wine for decades: Charlie Olken, publisher of the Connoisseur’s Guide to California Wine. Dunn isn’t surprised that his views aren’t widely accepted. “People think I’m a fanatic,” he says. “An extremist. 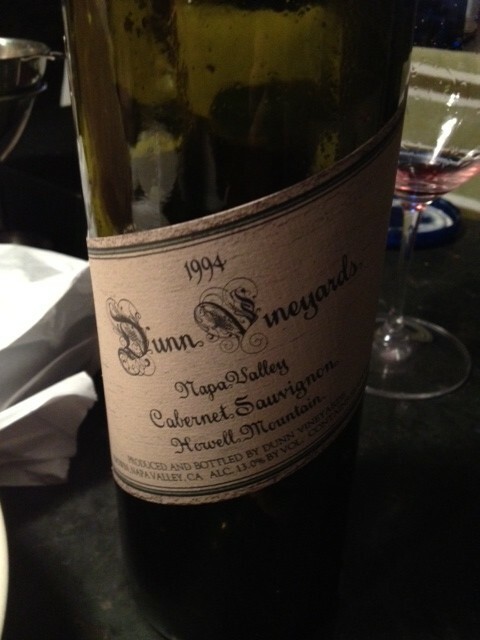 But the proof is in the wines.” Of that 1994 Howell Mountain that I so enjoyed, Dunn tells me, “It’s coming around. It’s pretty good. They’re just now getting there, the wines from the 90s.” It would be remarkably egotistical hyperbole if it weren’t true, based on recent tastings. If Dunn is right, and countless high-end Cabernets from the floor of Napa Valley are going to be fat, soupy messes in a decade, then the question becomes: Will winemakers change their habits? Dunn feels that instead of the valley floor following the mountain’s lead in recent years, more mountain producers have decided to make high-alcohol wines. He’s quick to name names, which might upset his neighbors, but Dunn values honesty before tact. He points to Ladera and Lamborn in particular. He might be right. It won’t be long before we can decide whether Dunn is correct in his assessment of high-end Cabernet or if he’s just a cranky winemaker up on the mountain. Schrader wines have just crossed a decade; Scarecrow, a white-hot wine, is just a few years old. There are countless others that fetch triple-digit prices but have yet to pass the toddler phase. One thing is certain: It will be far less expensive to build a vertical of Dunn Howell Mountain Cabernets, and—with a little patience—the results are likely to be captivating. That’s the kind of wine that should build a cult following, even without the garish prices. Hey Evan, just wanted to clarify for you the alcohol labeling laws for wine. What you stated; “Legally, wines that are higher than 14% alcohol by volume can be labeled one degree higher or lower than the actual amount.” is incorrect. The law is simply that the label alcohol needs to be within 1% of the actual alcohol, regardless of what side of 14% that it falls. The 14% gets mentioned so often because that’s the limit between tax class 1 and tax class 2. I think the actual point is 14.02%? Anyway, anything under is tax class 1, and thus the winery has to pay less tax per case. So if a wine is labeled under 14%, you can bet your paycheck it is no higher than 13.9%. Getting caught paying less tax by the TTB is a bad move. 🙂 So yeah, if a wine is labeled 14.2% for example, it can legally be 15.2%. Despite what most wine writers would like you to believe, wineries actually try really hard to give you an accurate alcohol on the label. It gets difficult because most final blending occurs after labels get ordered due to the tremendously long delay in label deliveries. So winemakers do ‘mock blends’ using winery inventory software to get the best estimate of what the final blend is going to be. At least that’s been my experience in over 15 years in wineries. Hope this helps. Mike – Very good, thanks for the info. Is anyone else tired of Randy Dunn’s nonsense that he is the only guy in Napa, heck California, that is making decent wine? “Everyone is wrong but Randy” should be the title to every article he gets. He would have no credibility of his wines weren’t so good. But they are. Some of his comments are viewpoints taken to extremes, but his points are often well made. The commentary is spot on regarding Napa cults, particularly mountain cabs. For consumers, the difficulty comes when they want to drink young 2007 Dunn, but they should be drinking prime 1994 Dunn. The winery then must play a valuable part in educating consumers about their wines abilities. Randy has done a great job of this, but a lot of quality age-worthy wines are get slaughtered young. Some may call it ‘infanticide’, and it can be prevented. Ryan – Good points. I enjoyed the visit to Mayacamas, where they always have a current release (that is typically six years old or so) along with older wines on offer for exactly the reason you describe. Cheers, Quality and Price in Napa wines are often high on both sides, but having them inverted with Flavor out shining Price. You know you found a Gem. So get on the mailing list before everybody finds out about it – Great Article !!! The legal limit is at 14%, not below. So a wine labeled 14 cannot be any higher, and can be as low as 12.5. The leeway in the lower tax class is 1.5. That is why many French wines have permanently printed 11 to 14, or 12.5. It covers the full range up to tax limit. But in the higher tax class, 14.01 or .02, the leeway is 1, but it is unlikely that the actual is under, since the tax would be lower. So yes, a wine labeled 14.2 can be as hi as 15.2, more likely they are a few tenths higher but not the full 1 because the penalty if you get tested and are out of range, is a stiff penalty. And Dunn is not saying the wines taste bad now. Nobody would say they taste bad when released in the market. He is saying that they won’t change the way that lower alc. higher acid & tannin will change. I have only been in this world a few years, but I get disappointed when I go the Rutherford Dust tasting and they are all very similar. Espec. compared to the vineyard and village differences in Burgundy. Even for $50 price range wines, Burgundies taste different in different villages etc. I doubt that you could really tell location in a tasting of $50 to $100 Napa from Oakville vs. Calistoga. Delicious, yes. Different among? Who is kidding. Mayacamas Cab? Stands out like crazy against the valley floor Cabs. And if you have the opportunity to taste 20 or 30 yr old Inglenook Cask, Freemark Bosche, BV Latour, Franciscan Reserve Justin Meyer era, or similar, they resemble Bordeaux of similar age. The silky texture is what amazes me. Or, for another avenue to see village differences, go to the Mosel v Rheingau. Schartzhofberg v Vollrads. Donnhoff or Diehl v Loosen. Erbacher Marcobrunn v any Mosel. And they cost less than Bond SE etc. Last, why judge the wine completely on the alcohol – to rule out an entire class of wines based on the alcohol level seems counter intuitive – isn’t wine supposed to be enjoyed? Rule out the wine based on the flavor, not the alcohol level. I have tasted insipid wines at all alcohol levels and incredible wines at all alcohol levels – I don’t immediately rule a wine out because it is “x %” alcohol. It is clearly not only about the alcohol level. However, it all comes back to the decisions taken by the winemaker. If you do not pick the Cabernet Sauvignon grapes at a “normal” ripeness level, but choose the over-ripe style ( surely so common now, that “normal” has become under-ripe), your acidity will drop, the fruity character will shift from fresh fruit to jammy/cooked fruit. The alcohol level therefore, while not the only parameter, clearly indicates that the winemaker( or equally likely, the owner) has deliberately chosen this style. I have to disagree with your quoted alcohol levels in Bordeaux wines. I just drank several bottles of delicious 1966s at 11.5 %. Even the 1982s stayed under 13 %. It is only recently, that prominent wineries in Bordeaux has made the inexplicable decision to imitate their New-World counterparts. How ironic is this? It leaves me longing for delicious wines like the 1966 Krug or the 1986 Dunn. Evan–Thanks for the kind words. And, per your generosity, I will post my entire commentary to you on my website at http://www.cgcw.com on Tuesday morning. Let me add a couple of points here. Randy Dunn has offered no definition of long-aging except to say that hillside wines will age longer than valley floor wines. He may be correct, but the bigger and better question is how long is long enough to make the point moot? I ask because if we take twenty years as a marker of sorts for successful long-aging and do not hold out for forty, then Mr. Dunn vastly overstates the case. You have mentioned a couple of wines in Araujo and Dominus, in addition to Corison. The list does not end there, and many of the valley floor wines that age well are also over 14% in alcohol. Consider Spottswoode, Shafer, Stag’s Leap Wn Clr, Mondavi Reserve, Lewis, Hobbs ToKalon (or almost anything else from ToKalon), Quintessa, Heitz Martha’s Vineyard, Phelps Insignia. And that list is just the beginning. It is, as was mentioned above, much more a question of acid, tannin, fruit balance than it is about less or more than 14% alcohol. That number is a red herring that would not come into play if the legal dividing line for tax purposes were something else. But, the bottom line, of course, is that wine drinkers do not drink labels, they drink wines and they do not judge wine by labels but by taste. And while I don’t mean to pick an argument with Mr. Dunn, the fact that he did not mention any of these names from memory does at least suggest some limits in his tasting breadth. Final point: I have, as you have suggested, collected a lot of wine over my almost four decades in the biz, and wines like 1970 Beaulieu, 1974 Heitz Martha’s Vineyard, 1979 Clos Du Val, 1978 Shafer all tasted recently are fine fettle at thirty to forty-plus years. And a 1991 Shafer tasted just days ago was mind-blowingly good and will age another fifteen years for starters. There wont’ be any problem with these wines in 20 years, as Dunn says. That’s because nobody will own any. They will be drunk within 5 years of release. No wine, no problem. Lubbock Texas! Just wanted to mention keep up the great job! Our Howell Mountain Cabs, after a decade or more of aging in the cellar, are far from “fat, soupy messes.” Randy is a great winemaker, as is our winemaker, Heidi Barrett. Heidi is well-known for many things, and balance is one of them. While our Cabs come in around 14.8% and our Zins in the lower 15’s, the balance Heidi creates in each bottle is, if I’m allowed to say, “perfection” and they drink beautifully. Not only that, but they both age impressively well – even our “drink and enjoy now” Zinfandels. Since Randy’s comments were specifically regarding our Cabernet, I would like to send you a bottle each of our ’03 (inaugural Cabernet vintage), ’04 and ’05 – three vintages that are a minimum of a decade old – and see what you make of Randy’s comments after. The offer stands for our Zinfandel as well, because we stand behind those as well. Our inaugural Zin vintage was 1982 and we certainly know our style and the wine’s age-worthiness by now. I am a fan and supporter of Dunn wines and Randy himself. But he’s wrong about our family wines and we’d be happy to have them speak for themselves if you are interested! I can always be reached at brian (at) lamborn.com to arrange delivery. Thanks again for your article! I just had a bottle of the 1990 Dunn Howell MTN and it was phenomenal at 26 yrs of age… Also had a 1996 Lokoya Rutherford and 1997 David Arthur Elevation 1147 that were just as good if not a little better. But the real surprise was the 1993 Abreu that was arguably one of the best wines I have ever had. Cheers to old school Calif Cabs!! !